If you are on the hunt for a new condo in the Regina area there are a lot of choices out there but you have to be sure you are comparing apples to apples in terms of building specs and finishing quality! Those two items affect pricing and also the long term value of your purchase! 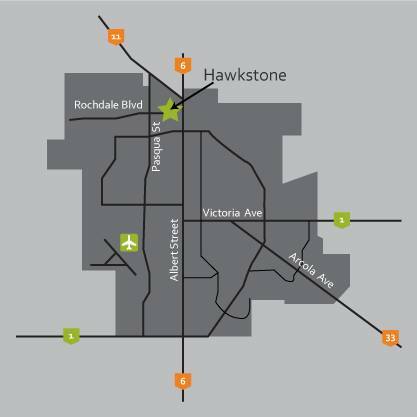 Hawkstone Village has the benefit of a builder/developer with 30 years’ experience in custom home building in Regina and a solid reputation for the quality of their product, and it shows in this project! We, your Trusted Regina Real Estate team, are happy to represent this project on behalf of Varsity & Gilroy Homes. Standard units now start at $255,000 including one electrified parking stall, Hunter Douglas blinds package and $3200 appliance credit. Great upgrade options available including granite, laminate & tile flooring and central A/C. And you can choose one of the units we have prefinished or customize your own and choose your own colour scheme. You don't have to sacrifice style at Hawkstone Village. Short possessions are available so you can just pack your bags and move-in! Come and check out the project …our show suite is open weekends 2-4PM or by appointment. 3469 Elgaard Drive, facing Rochdale Boulevard. If you need answers or help navigating your home purchase process, we are here to help you make the right move!